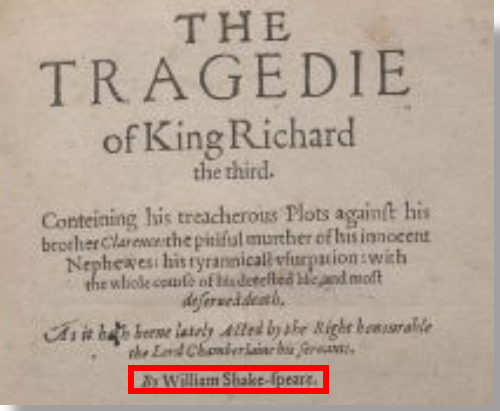 Given the number of plays (eight) in the canon devoted to the War of the Roses (Richard II, Henry IV, Part 1, Henry IV, Part 2, Henry V, Henry VI, parts 1, 2 & 3 and Richard III), we must ask why Shake-speare emphasized this particular period of English history. The answer is simple: Edward de Vere was paid £1,000 a year by the queen to create propaganda to justify Tudor sovereignty. In addition to most of the history plays serving this purpose, the earl wrote anonymous homilies that were delivered via pulpits across the land. It's really no different than what goes on today via Broadway and the evangelical churches: historical facts are rewritten as propaganda to serve the objectives of those pulling the strings. Donald Sewall, the principal and pre-eminent force behind the creation of the Denver Center for the Performing Arts, reminded me, over a series of annual lunches we shared some years back, during the New Play Summit, that Richard III got a bad rap from "Shakespeare." I agreed with him (Mr. Seawell was a member of the Richard III Society), and explained that de Vere synthesized a number of requirements in what is arguably the most powerful of the canon's histories (alongside Henry V): show Richard's illegitimate rise to power; extol the virtues of the House of Lancaster; and, on a personal note, polish a few rough spots in the history of the earls of Oxford.1 Mission accomplished, for the Tudors, for de Vere, and for Mr. Seawell's open-mindedness regarding Oxford. 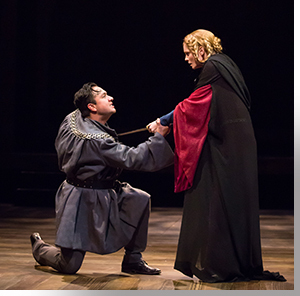 In the Colorado Shakespeare Festival's current production of this classic, director Wendy Franz and Rodney Lizcano, as Richard III, find a marvelous balance between the tragic and comedic elements—Richard's complete ruthlessness and depravity versus the sadly comedic means by which he manipulates people, and gleefully shares with us in a running series of asides. Lizcano's ease at moving between dark, amoral duplicitousness and light, mocking cynicism alternatively draws gasps and laughs from the audience. 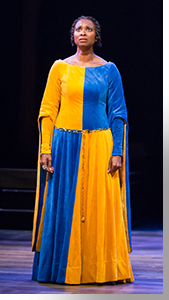 As Richard, Duke of Gloucester, works his way through murdering his brother, his nephews, and other notables on his bloodthirsty path to being crowned Richard III, it is not his fellow noblemen that issue the greatest rebukes; rather, it is Queen Margaret (Anne Penner)—widow of King Henry VI, of the House of Lancaster, who was deposed by King Edward IV, of the House of York, Richard III's father—who is his most vocal and persistent adversary, both with her tongue-lashings and her curses. The 2nd quarto of “Richard III,” 1598. Note the hyphenated pen name. 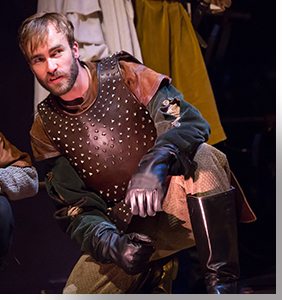 Upon revealing his intent to us, Gloucester immediately begins to illustrate how he will pursue his dark course, by parrying with his brother George, Duke of Clarence (Jihad Milhern) and William, Lord Hastings (Sam Gregory), and then revealing their fate to us. Next comes one of the most stunning scenes in the canon, in which Lady Anne (Lindsay Ryan) is accompanying the corpse of the recently deceased King Henry VI—who was slain in battle, as was his son, Prince Edward (Lady Anne's husband), both at the hand of Gloucester—when she is confronted on the road by Gloucester. 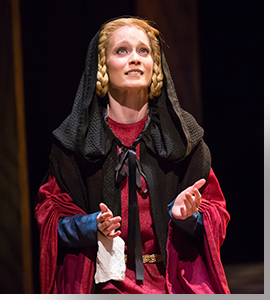 The scene begins with Anne expressing her hate for Gloucester and ends with her agreeing to marry him. 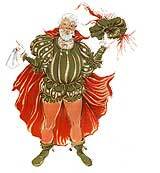 What wizard disguised as a playwright could get us to believe such a preposterous turn of events? Thou wast provoked by thy bloody mind. Richard III (Duke of Gloucester). I grant ye. Lady Anne. He is in heaven, where thou shalt never come. Lady Anne. And thou unfit for any place but hell. Richard III (Duke of Gloucester). Your bed-chamber. Lady Anne. I'll rest betide the chamber where thou liest! Lady Anne. I hope so. Lady Anne. Thou art the cause, and most accursed effect. And this is just the warm up! We will leave the resolution for you to witness, but not without telling you that Renner and Lizcano's confrontation will leave you enraptured. 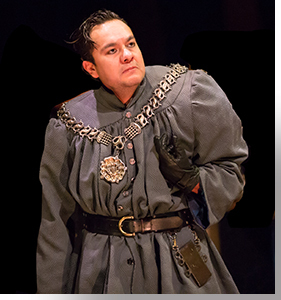 After Gloucester has his brother, Clarence, murdered, he uses the news to send an already ill and weak King Edward IV (Leraldo Anzaldua) to his deathbed, which leaves Gloucester as Protector to his nephews, whom he has sequestered in the Tower of London, to prevent the eldest from being crowned the next king. There, Gloucester has them murdered, after a well-staged propaganda campaign orchestrated by the Duke of Buckingham (Sean Scrutchins, who deftly turns Buckingham's obsequiousness to Richard into duplicity towards all), paving the way for Gloucester's coronation. Then, Gloucester (now King Richard III) poisons Lady Anne, to be free to marry his niece, Elizabeth of York, Edward IV's next remaining heir. 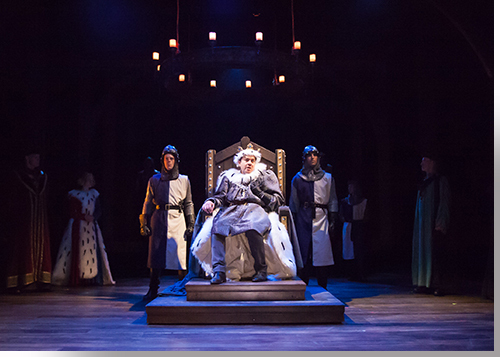 All of this ends with King Richard III confronting the mother of the two princes, Queen Elizabeth (Betty Hart), who, along with his own mother, the Dutchess of York (Leslie O'Carroll), and Queen Margaret, bury him in curses. 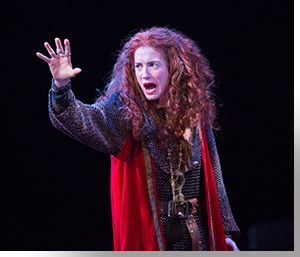 Hart is majestic as she confronts the murderous king. King Richard III. The time to come. As Queen Elizabeth, Queen Margaret, and the Dutchess of York portend, Richard III's crimes eventually catch up to him on Bosworth Field, where, famously, he loses his horse and then his life, to Henry, Earl of Richmond, of the House of Lancaster, who becomes Henry VII. With that, the War of the Roses comes to an end, and the royal line leading to Queen Elizabeth I is established and justified. 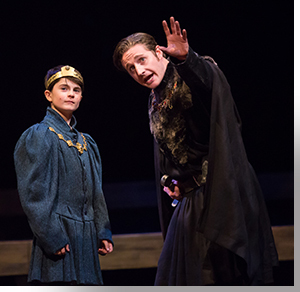 The Colorado Shakespeare Festival's presentation of Richard III, by "William Shake-speare," runs through August 11th. For tickets: https://cupresents.org/. 1The 13th Earl of Oxford helped depose the Yorkist king Richard III, and is a character in the play. There is a stone bas-relief, thought to have hung in Castle Hedingham (the ancestral seat of the earls of Oxford), that depicts the victorious Henry Tudor riding triumphantly with the earl of Oxford at his side; however, de Vere seems to have embellished his forebearers' role in the Henry VI plays. Mark Anderson, "Shakespeare" by Another Name, Gotham Books, New York, 2005, p. 5.